Big Democratic wins in the two states holding gubernatorial elections yesterday — Virginia and New Jersey — stand to solidify a regional alliance to combat climate change. A Democratic victory in a special state Senate election in Washington state provides momentum for the ambitious climate action plans of Gov. 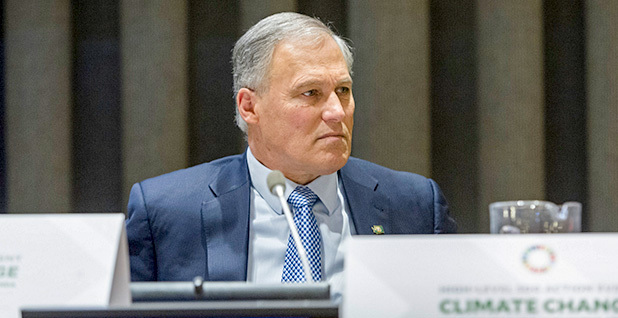 Jay Inslee (D). And a bond question to fight sea-level rise in Miami passed by a wider margin than anticipated (see related story). Democrats and their allied groups — including environmentalists — were exultant last night, steadfast in their insistence that voters had delivered a major rebuke to President Trump and his agenda and giddily anticipating the 2018 midterms. The Virginia gubernatorial election between Lt. Gov. Ralph Northam (D) and former Republican National Committee Chairman Ed Gillespie was the big prize, a tight and expensive race with dramatic implications for both political parties. Northam was quickly declared the victor last night and eventually rang up a surprising 9-point margin. "Today will be remembered as the day Virginia rejected the politics of hate and fought for good jobs, clean air and water, and justice for every community," said Tom Steyer, the climate change-fighting billionaire and president of NextGen America. He spent Election Day rallying the troops in the Old Dominion. "Millennials and people of color showed up at the ballot box today as a clear, outright rejection of the Trump agenda," Steyer said. "The Trump playbook of hateful rhetoric and race-baiting tactics didn't work here in Virginia, and it won't work across the rest of our country. Momentum is on our side going into 2018, and this victory is the first step towards a more progressive and just future for every single American." Between Northam's victory in Virginia and the big win for former Goldman Sachs executive Phil Murphy (D) in the New Jersey gubernatorial election, environmentalists have seen a solid return on their investments this year and have installed strong allies in two critical state capitols. Murphy will replace Gov. Chris Christie (R), whose popularity plummeted during his second term and who notably pulled the Garden State out of the Regional Greenhouse Gas Initiative (RGGI). The nine-state program caps and reduces carbon emissions from the power sector. Greens have also hit Christie for siphoning money from settlements with polluters and using it for general government spending instead of environmental cleanup (Climatewire, Oct. 30). But New Jersey voters by a wide margin yesterday embraced a proposed amendment to the state Constitution creating a lockbox for environmental settlements to be used for remediation, parks and recreation, and urban tree planting. "The environment played a major role in this election, and we worked hard for many months to elect a governor who is committed to restoring New Jersey to a position of national environmental leadership," said Ed Potosnak, executive director of the New Jersey League of Conservation Voters. "Murphy pledged to put New Jersey on a path to achieving 100 percent clean energy by 2050. A win for [Murphy's] ticket is a win for our environment." Murphy has pledged to re-enter New Jersey in the regional carbon program, and in Virginia, Northam is expected to follow through on an executive order by departing Gov. Terry McAuliffe (D) to explore the possibility of the state joining an existing cap-and-trade program. Assuming New Jersey rejoins RGGI and Virginia becomes a part of it, the alliance would extend from Virginia up the Eastern Seaboard to Maine, taking in every state but Pennsylvania. The Virginia League of Conservation Voters Political Action Committee invested more than $4 million in the 2017 election cycle, the most in the organization's history. It included a ground campaign that knocked on upward of 350,000 doors, the organization's leaders said last night. The green group's efforts in the commonwealth helped yield victories for the entire Democratic ticket. That includes a win for Lt. Gov.-elect Justin Fairfax, a strong environmentalist. And Democrats picked up a significant number of seats in the state House of Delegates, though it was not clear early this morning whether they would actually seize control of the chamber. Republicans hold a narrow 21-19 edge in the state Senate. Trump, who had recorded robocalls earlier in the day for Gillespie as part of the GOP's last-ditch turnout operation, was quick to distance himself from the party's failure in Virginia. "Ed Gillespie worked hard but did not embrace me or what I stand for," the president said in a tweet last night. Meanwhile, in the Pacific Northwest, Democrat Manka Dhingra's victory over Republican Jinyoung Lee Englund in an open state Senate race flipped control of Washington's upper chamber, where Republicans had held a one-seat majority. Dhingra took 55 percent of the vote to Englund's 44 percent. National climate activists and oil companies poured more than $8.5 million into the race, making it the most expensive legislative contest in Washington history. The win gives Democrats complete control of three state capitols along the Pacific Ocean — in Washington, Oregon and California — and provides an immediate boost to Inslee, who has argued that Trump's hostility to climate policy has increased the need for state action. "We've had good bipartisan successes in Olympia over the past few years and that will continue. I also look forward to action on some issues that have stalled for too long," Inslee said in a tweet, congratulating Dhingra on her win. Dhingra's victory immediately raised environmentalists' hopes that Washington would revisit the subject of a carbon tax, one year after infighting among environmentalists helped sink a similar measure at the polls. "We're excited to work with a pro-environment House, Senate and governor on a host of environmental protections," said Shannon Murphy, president of Washington Conservation Voters, "whether it's carbon pricing, oil transportation safety or toxics or presentation. We see all these areas as policies that are on the table."